:Home/Two more nominal oaks appeared in the Mikhailovsky Garden! Two more nominal oaks appeared in the Mikhailovsky Garden! November 12, in the Mikhailovsky Garden of the Russian Museum, the annual action “The Tree of Life” took place. 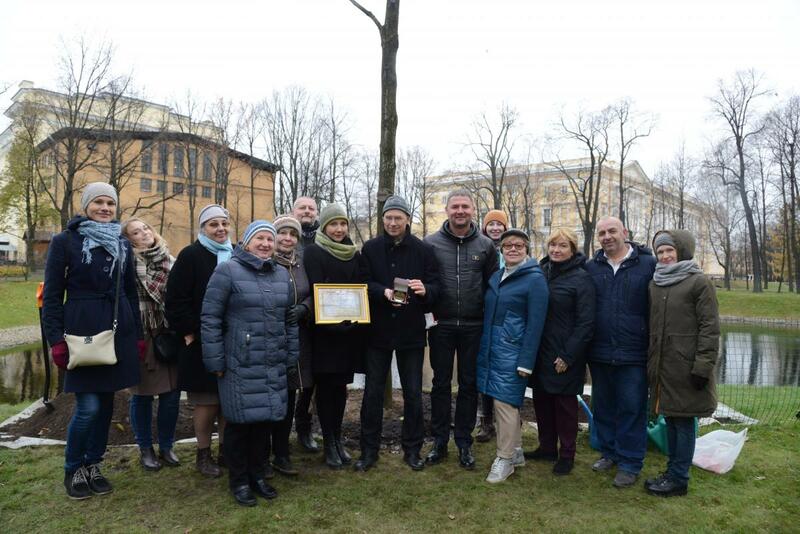 The honorary right to plant your oak tree, this time, was given to: Renny Sergey Vladimirovich – head of the branch “Summer Garden, Mikhailovsky Garden and Other Territories of the Russian Museum” and Osipov Andrey Alexandrovich – Director of the Contracting Organization “Intex” and museum areas. The majestic seven-meter saplings of pedunculate oak (querqus robur) were planted: one on the side of the pond, near the Rossi bridge and the second near the terrace of the Mikhailovsky Palace. We remind that the “Tree of Life” is a long-term project of the Russian for the restoration of the lost old-growth trees in the gardens of the museum, taking into account the species diversity.